Have you been following our journey on ‘The Awakening of Self’? 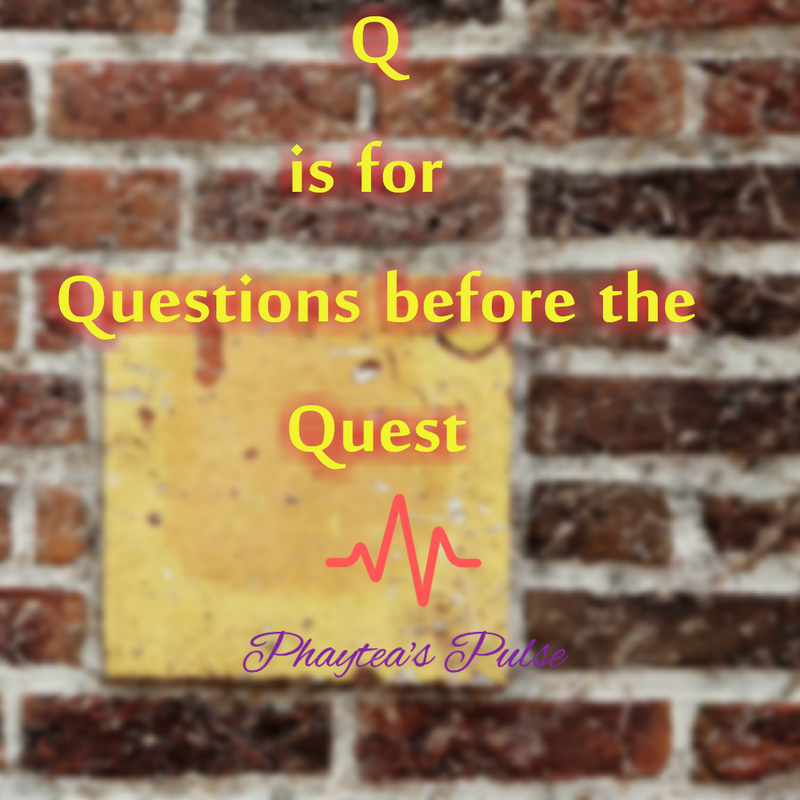 We finally get to letter Q and I am not as worried as when i published the theme reveal post. I previously thought I will not have topic ideas for Q but it turns out I even have two. I have saved the other topic in my draft for later and will now move on to today’s entry. If you read Exceeding Limits( Leaving your comfort zone), then you already know that it is wrong to just dive into a new project. Asides from the five important things we need to do as discussed in Pushing the Envelope, it is also necessary to ask ourselves thought provoking questions before we embark on a quest. We should also ask ourselves these questions after frantic effort have been put into achieving a desired goal. 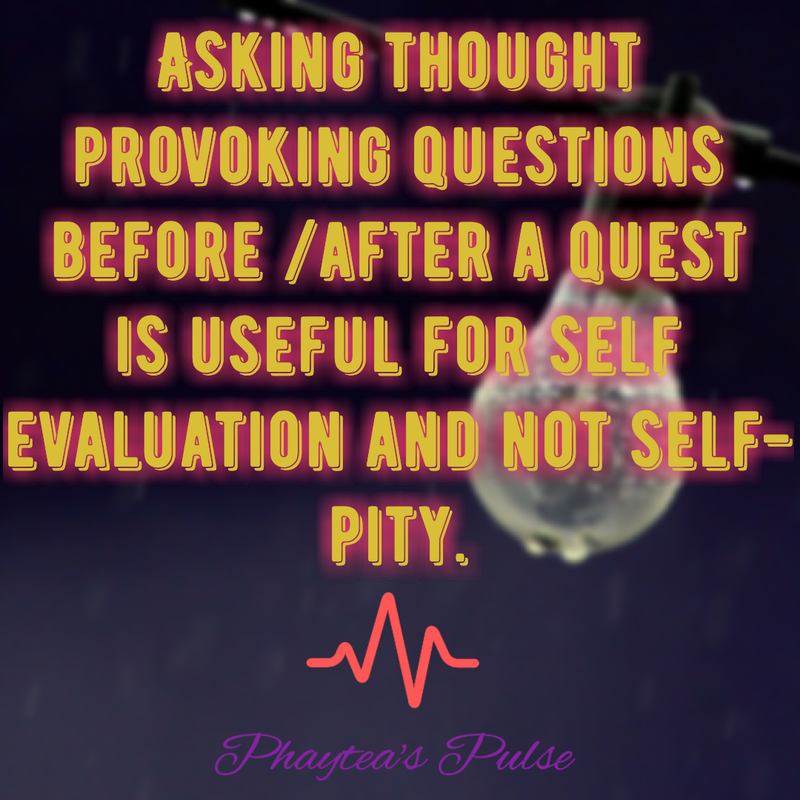 Regardless of a successful or unsuccessful outcome, these questions are recommended for self evaluation, self awareness, mindfulness and meaningful living …and not because of self-pity and regret. If these questions are genuinely answered, it will spur us into action, and give us a direction towards guarding and achieving our goals. what we really want to do or not do. what we need or do not need. what we have to restore or discard. Do I want to change something about myself? Do i know my strength and weaknesses? Can I criticise myself constructively? Do I really need to argue? Am I patient when others try to communicate? Do I always need a second opinion before making decisions? Am I willing to leave my comfort zone? Do I know my most valuable skill? Do I accept my mistakes when I am wrong? Do I know how to guard my goals? Do I enjoy or endure my current job? Do I have healthy habits? What is more important to me. Health or wealth? Am I content and grateful for what I have? If I wasn’t already involved in this, will I be interested if asked again? Do I love to love and be loved? Do I deserve a second chance? Do i have enough resources? Am I spending too much time on a particular task? What takes most of my attention during the day? How is my relationship with God? Whether we are on a quest to find our purpose, happiness, love, relationship with God, new job, health….. There is question in there for every quest. If you think i missed out any question please feel free to add yours in the comment section. Did you try to answer any of these questions while reading? If you have nine genuine answers from these questions then you are definitely living a meaningful life. What other questions do you ask yourself before the pursuit of a goal? Thanks for this Faith. I can answer yes to a good number of these, but certainly not all. I need to re-read this and see what I can improve on. Q is Quest for Quality as you Build a Better Blog. 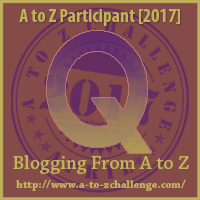 #AtoZchallenge. I’ve asked myself several of those questions over the last few years – especially in regard to work, what’s important to me, what my priorities are etc – it can be really helpful to question ourselves and see if we are happy with the answers. I answered yes to a few of these questions. Thought-provoking post. I will review the no’s for personal improvement. It was fun to answer these questions! Looks like I’ve got a lot to work with. hi hi…how is it going so far? Really great questions you posted for self-reflection. Everyone should do this from time to time. Well that is certainly a comprehensive list of questions! Posing and addressing these types of questions can only help in improving what it is we want to achieve. It is really all about self-improvement and this is a great way to help each of us get there. Awesome post. Those questions are def a must do for self-discovery. That was inspiring! Thanks for sharing! It is always good to ask those questions. i definitely answered yes to some questions. I guess i need to start working on myself. oh wow! I loved your article a lot! Yes to most of the questions. Great post. You are right we definitely have to ask ourselves once in awhile those questions and fix it if we are failing in something. Previous Post Private time with your creator (Pray).